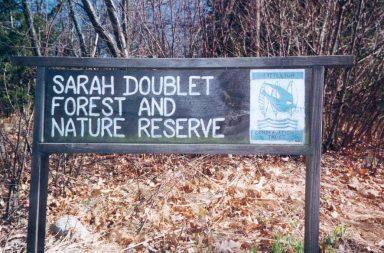 Sarah Doublet Forest is the largest property of the Littleton Conservation Trust. This area is within the historic Nashoba Indian plantation. Access is by way of Charter Road (a dirt road) leading off Nashoba Road. A Trust sign is on the corner of this dirt road and Nashoba Road. The dirt road leads to a parking area on the left where another Trust sign is located. Another access way is through the Ed Bell trail starting at the town-owned parking lot on Nagog Hill Road. Well-developed and maintained. The kiosk at the parking area has copies of trail maps and other information about the property. The Knapp-Jenkins Trail (Orange) takes you from the parking area past the old foundation with standing chimney and across the AT&T cable line to the Wunnuhhew Loop (Yellow). This trail goes up and down through overgrown pasture and into pine forest passing an old stone quarry. When you return to the cable line, go down hill a few steps to find the Tatatiquinea Loop (Red) which goes down past some vernal ponds and into a wonderful yellow (in late autumn) area of witch hazel shrubs. You can return on the AT&T line or reverse direction (red markers) on the trails. Another trail (White) proceeds from the parking lot area downhill to the shore of Fort Pond. At the intersection of Charter Way and Nashoba Road, a new trail has been established that proceeds northerly through the Nagog Hill Orchard woodlands and private property to Nagog Hill Road. The trail continues on the northerly side of Nagog Hill Road. This property was willed to the Trust in stages (1975 and 1976) by Edith Jenkins and Fanny Knapp, two nurses who turned farmers in retirement. The house and final acreage were passed to the Trust in 1988. Chuck Roth, biologist and educator, created an inventory of the wildlife and plants observed on the property. This list is posted at the kiosk. The Trust owns the house near the parking area. Rick Roth (Chuck Roth’s son) and his family are the caretakers of the house. The Dr. Ed Bell trail (Blue) is named in memory of Dr. Ed Bell who died in 2001. Dr. Bell was a leading citizen in Town who was well-known for helping others. He was a Littleton Conservation Trust board member for nearly 40 years. Sarah Doublet Forest was one of his favorite places. The trail starts at the town-owned parking lot on Nagog Hill Road. It passes over the hill top and along a unusual bedrock ridge topped with a curved stone wall and meets the Sarah Doublet forest trail. The stone cairn is in Ray Grande’s memory. Ray was a tireless volunteer in Littleton Conservation Trust, the Reuben Hoar Library and Loaves & Fishes Pantry. Ray and others created many of the trails on this property. Trails are steep and rocky at some locations. Poison ivy is under control.